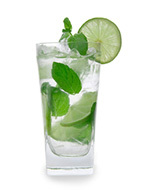 In a glass, muddle lime juice with sugar, add mint and mush against the sides of the glass. Fill glass 2/3 full with cracked ice and pour in the rum. Top off with club soda. Garnish with a lime.